Greetings Friends of the Boys & Girls Club of Morgan County! 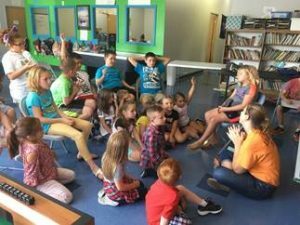 Our mission is to empower all young people, especially those who need us most, to reach their full potential to become productive, caring, responsible citizens! First part of the year Celebrations and Holidays – Valentine’s Day, St Patrick’s Day, April Fool’s Day, Easter Sunday! Wishing you fun, safe, and memorable moments! 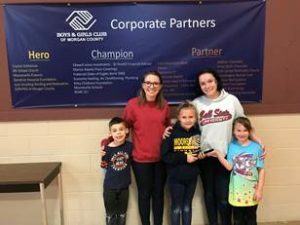 Thank you for the programs and services that your giving provides for youth with the Boys & Girls Club of Morgan County! 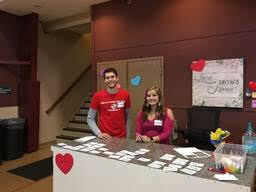 Thank you for joining us on Valentine’s Day for Eat, Thank, Love – our donor and community Thank You Luncheon. 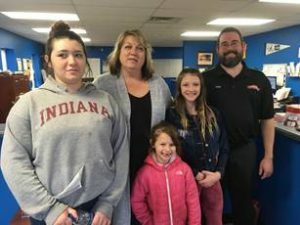 Our event committee – Jen Reed with Mt Gilead Church, Barb Milton with Andy Mohr Chevrolet, and Denise Aspin with Edward Jones Financial Advisors created a fun and memorable event . Guest speakers were Erin Bechtold, Principal of Northwood Elementary School, Ashlee Aspin, mother of Club Member Brandon, and Karen Branch, Executive Director of the Montgomery County Youth Services Bureau. Chic-Fil-A, Mt Gilead Church, and the Batter Bowl provided an amazing buffet! DJ Josh Hargis and the kids at the Boys & Girls Club created a celebratory and grateful atmosphere! 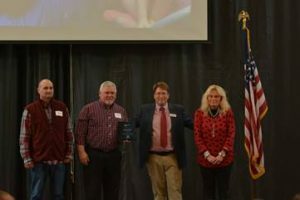 Our deep sense of gratitude was shared with The Dillon Family, The Williams Family, and the MCSC Transportation Department during Eat, Thank, Love for the Leadership and Vision they have given to the Boys & Girls Club of Morgan County. 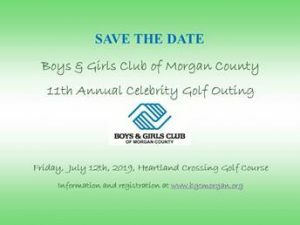 Friday, July 12, 2019 is the date for our 11th Annual Celebrity Golf Outing at Heartland Crossing Golf Links! Your support over many years as a celebrity, volunteer, sponsor, golfer, or Club member has created a beautiful tradition that grows and grows! You have made our Celebrity Golf Outing a model example of how a day of fun and fellowship on the links gives kids the support needed to become out tomorrow’s leaders. Your participation in the Celebrity Golf Outing sponsors 62 youth to attend the Club daily for an entire year! Our kids and families are so thankful for you! New friends are always welcome to join! You are giving our kids the opportunity to grow up, every day, in a safe place and have the guidance they need to overcome obstacles and become the productive, responsible, caring, adults, whom they are intended to be. Thank you, all, for giving hope and opportunity to the kids who need us most through the Boys & Girls Club of Morgan County! Looking for easy ways to share your support? Presented by Mt Gilead Church – Beginning Wednesday April 3rd and every Wednesday following from 11 am until 1 pm Chic-Fil-A lunches will be on sale to the public at the Mt Gilead Community Center – New Home of the Boys & Girls Club of Morgan County! Come in for a delicious lunch and see the new Clubhouse! Wednesday April 17th, Community Day ALL DAY, at Buffalo Wild Wings Plainfield , and the Boys & Girls Club of Morgan County will benefit from 10% of ALL Sales, all day long! Sponsor a golf hole at our 11th Annual Celebrity Golf Outing! Call us, 317-834-9744. Right after Spring Break it is back to the books and the Boys & Girls Club after school. 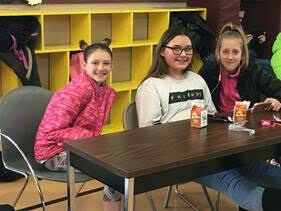 We are looking forward to moving up to the next year in school and enjoying a little summer time fun and friendship at the Club. Thank you for making our hopes and dreams possible!